Here's the next part that Karen and I have completed on Cheri's ABC Sampler. (it is $75 and you will need to email her for the pattern) I am using 3 different completed quilt tops to guide me as I get this quilt together and they are all different. Each one will definitely be unique! We finished Q and R so quickly we added it to our show and tell this week. We decided to work on the blocks below since they all square up together. I love both of the bird blocks!! The rooster got me anxious to get started on my "Year of the Rooster" quilt challenge. 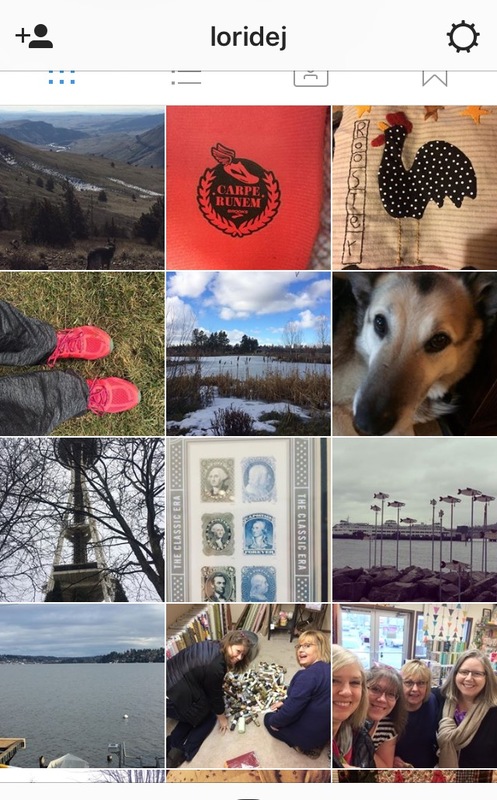 My instagram feed for the week! I made the trip North to get to the museum and support my friend Sharon Tucker by seeing her exhibit. She was the first person who asked me to do a workshop and lecture at her guild, so I was so excited she had this exhibit! It was called Touch of Improv and did not disappoint! The larger quilt here is on the cover of the latest issue American Patchwork and Quilting. Another exhibit was It's not Easy Being Green. Most of the quilts were artsy, but I photographed a few favorites. They had a Milliner Guild display as well. Here's the view from upstairs. It's a cute little town, definitely not on your way to anywhere though. I hope you enjoyed the photos. It was a really wonderful time spent with friends. Here's a little corner of Carriage Country Quilts, which we stopped at on our way to N. Seattle. My brother has a simple little condo on echo lake. Here is the view from the balcony. Here's a view from the dock. I picked Michelle up in Portland after work on Friday- she had Monday off so it made it worth her coming on this quick trip. 4 parts in Quiltmania. It was gorgeous! Her home is always good for a little photo op! A darling quilt with great use of the madder border fabric! Our first stop after Laurie's was Quilters Coop. JoAnn used to own a quilt shop in Temecula, but now she is in Stanwood. She mostly does online, but she graciously opened her doors for us. We had the place to ourselves, so we made ourselves comfortable. Linda and Michelle were especially happy to dig through the fat quarters. Linda was on the hunt for a red to go with her sampler blocks. Of course, we gladly gave our opinion! Here was a beautiful quilt on display. JoAnn and her husband live on this beautiful lake and they are building a quilt retreat home! I know it is going to be spectacular! She was as sweet as can be! A final photo before hopping in the car and making our way to LaConner Quilt Museum, now called Pacific NW Quilt and Fiber Arts Museum. We met Merry and Sharon at the museum then we all went to lunch. It was so much fun and the food was great! Then we made our way to Two Thimbles Quilt shop in Bellingham. I adore these reproductions that Lee was inspired by a vintage quilt that I remade. And here is the display of the Year of the Rooster challenge! Must get busy on mine. Love her shop! Thanks Lee for making us feel so welcome. It was a full and fun day!